Ah, Halloween, the season of trick o’ treating and pumpkins…. 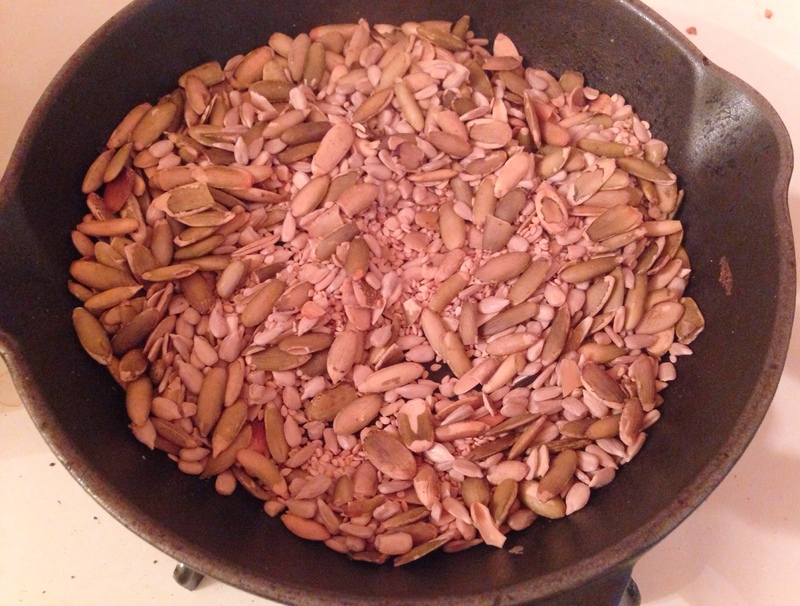 And where there are pumpkins, there are pumpkin seeds, also known by their Spanish name, pepitos. Pepitos are rich in nutrition: magnesium, zinc, Vitamin B, E, K and more. But what I really love about them is the added protein, crunch, flavor and fullness I get when I eat them. I like them roasted and salted. Both roasted and raw pumpkin seeds have nutritional value but raw has more as the roasting process can strip away some of the nutrition. I try to keep a bag around at all times, not just during pumpkin season, as I eat them as a snack, add them to lentil soup and to my salads. 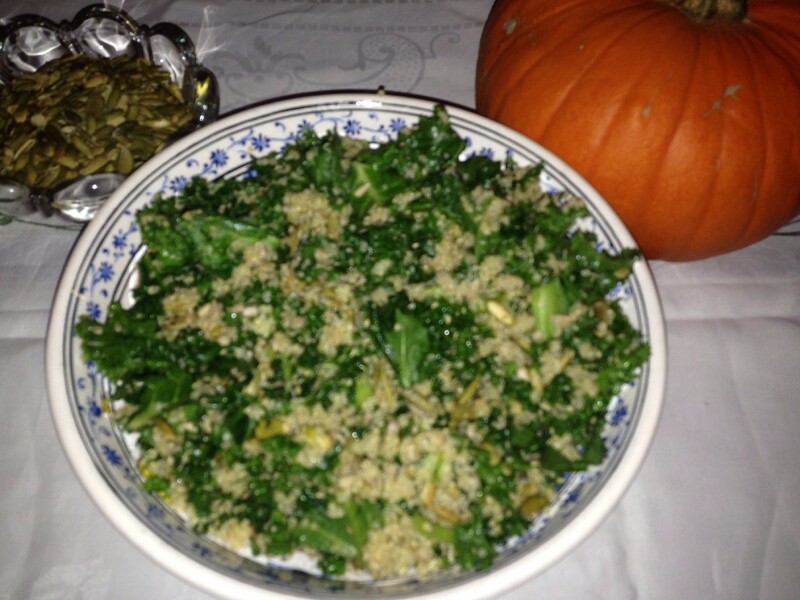 In fact, pumpkin seeds are the big flavor and crunch factor in my Kale Quinoa Salad with Pumpkin Seeds. I love this salad as you can eat it warm or cold, and the ingredients hold up in the refrigerator for a few days without the kale getting soggy or limp, like other salad greens with dressing on them. You can make this salad with just pumpkin seeds or use the blend of pumpkin, sunflower and sesame seeds that I use for added depth. When eating it warm, I use freshly cooked quinoa and toasted seeds and add them to the dressed kale and then mix it through. The heat from the quinoa and toasted seeds warms up the dish but doesn’t cook the kale. 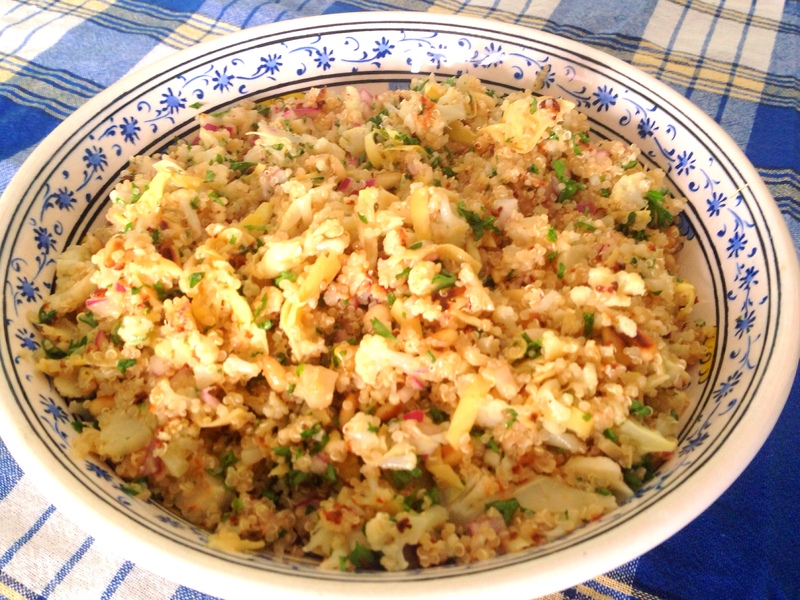 It’s a great side dish or main vegetarian dish with all the protein provided from the quinoa and seeds. Plus, it’s really easy to make. Add Kale to large bowl. In a separate small bowl, add oil, lemon juice and salt and mix. Add dressing to kale and mix through. In a saucepan on the stovetop add the quinoa, water and stock and cook until quinoa is done. In a non-stick frying pan, add the pumpkin, sunflower and sesame seeds and heat on medium flame tossing constantly, until the seeds are heated through but not burnt. Add the quinoa and seeds to the kale and mix through. Serve immediately or refrigerate until cool. 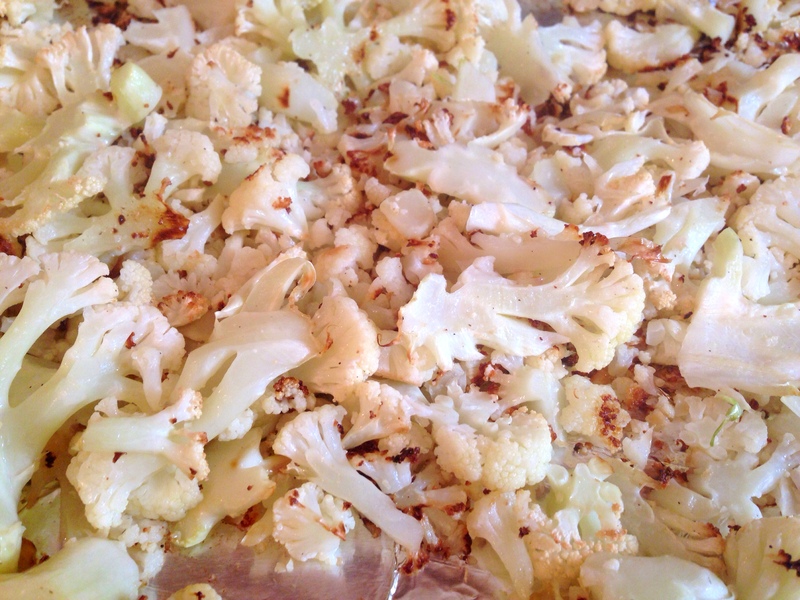 This entry was posted in Blog, Recipes and tagged Kale Salad, Pepitos, Pumpkin Seeds, Quinoa on October 30, 2013 by Leslie.